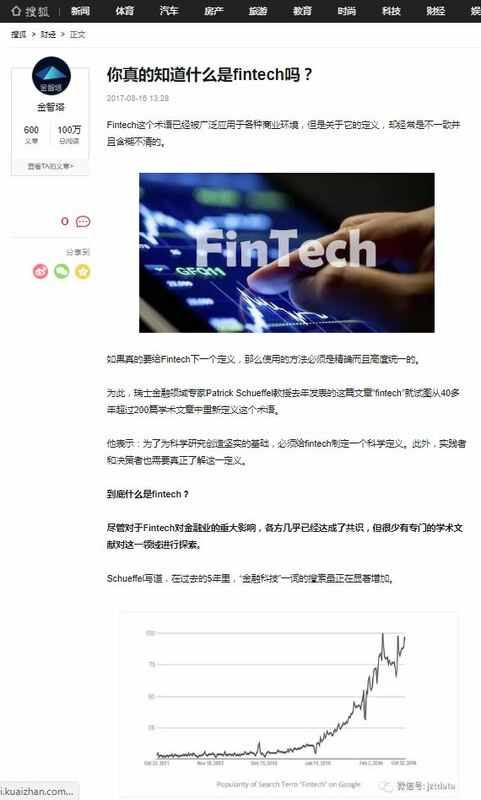 “Do you know what Fintech is?” – I am thrilled to see that my definition of Fintech is also catching on in China! Some people call Bitcoin a Ponzi scheme. I tend to disagree as I do not believe that the inventors of Bitcoin intended to operate a fraudulent investment operation. But Bitcoin does bear some commonalities with a Ponzi scheme. What is more, Bitcoin has the potential to bring down not only one major investment scheme, but multiple ones. Eventually it may turn out to be the Mother of All Pyramids (MOAP). Common wisdom has it that a Ponzi scheme requires an initial investment and the incentive for above-average returns. Moreover, the early investors and promoters of Ponzi schemes typically profit from the lack of investor knowledge. As far as Bitcoin is concerned, the anchor investors and supporters certainly benefited from the bandwagon effect they had been creating. Moreover, as a second characteristic of a Ponzi scheme, high returns typically attract new investors.Without any doubt this is also the case with Bitcoin. Thirdly, existing investors in the Ponzi scheme typically remain loyal to the system as they see their investments growing. If at all, only fractions of the investments are withdrawn. Here, too, I suspect that this is the case with Bitcoin. Hence, whilst Bitcoin may not be precisely a Ponzi scheme, the exponential inflow of money into the system in recent times are highly reminiscent of a pyramid. If Bitcoin shares some characteristics with a Ponzi scheme, it is worth looking at how Ponzi schemes typically unravel. First, if authorities do not stop the scheme, the promoters of the scheme oftentimes just disappear, pocketing as much of the investments as possible. A second possibility is that the continuous inflow of investment slows down and that therefore incumbent investors do not make the monetary gains that they were expecting, leading to a larger withdrawal of funds. Thirdly factors external to the scheme, such as an abrupt decline in the overall economy forces investors to withdraw funds, rendering the entire scheme unsustainable. Again, giving the founders of Bitcoin the benefit of doubt, let us assume they do not suddenly just vanish after swiftly trading their Bitcoins into real assets. However, it cannot be ruled out that we either witness a slow-down in the investment flow into Bitcoin or a downturn in the overall economy. So what is going to happen next then? Expressed in US Dollars Bitcoin has currently a market capitalization of appr. 134 bn. Given that this sum is larger than the governmental budget of Finland it is quite sizeable. A loss of these funds would represent a severe blow to many investors. But that is “only” Bitcoin. Taken together the twenty largest cryptocurrencies in terms of market capitalization make up an investment sum of more than USD 222 bn. which is appr. the governmental budget of Russia. But what has Bitcoin to do with these other cryptocurrencies? I would argue a lot: Anyone who has invested in Bitcoin early on must have been positively surprised about the development of his or her investment. It is furthermore likely that these investors have kept a close eye on other initial coin offerings. After learning the rather positive lesson of investing in a cryptocurrency, these investors may have invested parts of the gains they made with Bitcoin in other cryptocurrencies. So, if we assume that Bitcoin resembles a pyramid with investment inflows at the bottom and only fractional outflows at the top which are reinvested in other Cryptocurrencies, Bitcoin investors are likely to have created “clones” of their Bitcoin pyramid. These clones are likely to exist with other cryptocurrencies. 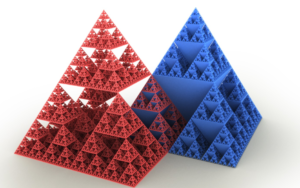 In other words, the pyramid is most likely not a simple pyramid any longer, but by now it most likely resembles a Sierpinski pyramid. This structure named after the Polish mathematician Wacław Sierpiński, is a showcase example of self-similar sets. In a rather scary fashion it reminds me of what we are potentially dealing with in terms of Bitcoin and cryptocurrency phenomenon. I therefore call this formation the Mother of all pyramids or “MOAP”. Being largely an unregulated field only very little solid data is available on cryptocurrency investments. Yet, it is fairly safe to say that the afore mentioned USD 222 bn. invested in the twenty largest cryptocurrencies is not the entire sum that may be at stake. Not only have cryptocurrency ETFs and hedge funds been developed in the meantime, but investors can also put their money behind Bitcoin derivatives, such as options, futures and OTC forwards. If we bring to mind that during its best times Lehman Brothers had “only” a market capitalization of USD 60 bn., its bankruptcy nevertheless marked a seminal event that intensified what later on became known as the Global Financial crises. This string of events eventually wiped out assets of appr. USD 1300 bn. What will further fuel this process in the case of Bitcoin is the lack of liquidity: whilst it is unknow who precisely owns Bitcoins it is a fair assumption that the wealth distribution in the world of Bitcoin is even more uneven that in the world at large. In a major downturn the few owners of vast amounts of Bitcoin are unlikely to become buyers, but are more likely to join the selling party for diversification purposes. This lack of liquidity which could also be observed in the recent Bitcoin upswings will intensify the downward spiral. On a positive note, however, some things are here to stay. The concept of the Blockchain which represents the underlying infrastructure for virtually any cryptocurrency will survive even the worst fallout. Even after Bitcoin and co. are gone, this seminal piece of technology will continue its triumphal procession in virtually any field of business across the globe. Author schueffelPosted on November 20, 2017 November 29, 2017 Categories Asset Management, Blockchain, Bubble, Economics, Fintech, Wealth ManagementTags Asset Management, Blockchain, bubble, economics, Wealth managementLeave a comment on Bitcoin – the Mother of All Pyramids?